The pair met at the White House today for the first time, in what was described by the Taoiseach as a "good meeting". Trade, Doonbeg and Northern Ireland were all discussed during the meeting which lasted around 40 minutes. "We also had an opportunity to talk about the Border and the President is very aware of the issues that could affect Northern Ireland if there was a return to a hard border. I think he'll be very much on our side in working for a solution to make sure that does not happen," Mr Varadkar said. The European Union has backed Ireland on the retention of a soft border and have called on the UK to show clear progress on the issue before Brexit talks can progress. 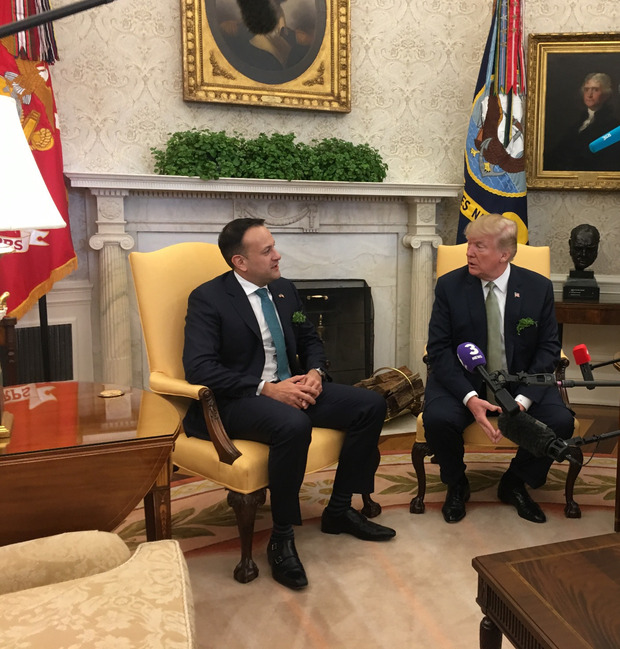 Ahead of today's bilateral meeting Mr Trump referred to the border issue, something he had indicated an interest in when he last spoke with the Taoiseach last summer. "That's an interesting border also," he said today. "We have two interesting borders - one happens to be where you are, right? It's going to be interesting to see what happens." Briefing the media after the meeting Mr Varadkar said a number of issues were raised, including the undocumented Irish. "We had a chance to talk about a number of different options, obviously we spoke about Doonbeg and the President is very proud of his property there and keen to visit it," he told reporters. "We also spoke about trade - the President has enormous concerns that the US isn't being treated fairly when it comes to trade by China and Europe. "I put across the view that maybe the best way to resolve this is a new trade deal between America and Europe - and the President seemed very open to that. "The President brought up the issue of the undocumented Irish and I think we've got a measure of support and a degree of enthusiasm from the administration to work on behalf of thousands of Irish here undocumented."